Take Deschutes' very drinkable Mirror Pond Pale Ale, and double everything in the recipe except the water. Now take two different vintages of that, and see if you can find your way out of the hall of mirrors. 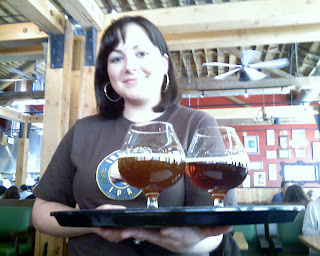 Dave and I went down to the Deschutes Portland pub for lunch today, so I could check out the two vintages of Mirror Mirror barleywine they have on tap: this year's and 2005's. Dave was there last week, and reported that the 2005 they were serving was excellent. I don't know if you tried the 2005 at last year's Holiday Ale Fest, but the sample I tried had gone around the bend, and I heard the same about the 2005 MM at this year's Barleywine Festival. So it was a delight to have a well-preserved sample of the 2005, and even more delightful to try it next to this year's model. The 2009 has the classic barleywine flavors of dense malt and strong alcohol -- without being out of balance. It's on the hoppy end of the spectrum, and in fact the fragrant hops are the main thing you get in the nose. The finish is very bitter. It's a delicious aperitif right now; give it a couple years in the basement and it will be even better. By comparison, the hops in the 2005 had mellowed quite a bit. They were definitely still present in the flavor, but the aroma was all whiskey -- most likely from the bourbon barrels that part of the batch was aged in. It was a delicious drink, the flavor beginning to get a little dusty, but not spoiled at all. In the picture above, the 2005 is the paler, cloudier snifter on the left; the 2009 is the darker clearer one on the right. I like this technique of doubled recipes from Deschutes. Mirror Mirror, Double Black Butte, Double Cinder Cone.... Is Abyss a Double Obsidian? The wife-proofed wax-dipped bottles of this year's Mirror Mirror are stamped confidently with a "Best After" date: April 2010. I agree, but I would also advise against keeping them too long. My current hypothesis is that two years is the right amount to age big beers. That's enough to let the ingredients mellow and interact, but not enough for the beer to decline. Whether it's this year or next, make sure you take a look in the mirror. I was getting whiskey flavors, but not the classic Bourbon taste you'd find in a Top Sail or Oregon Trail BB Porter. The 2005 was a nice surprise after a few bad run-ins with it at festivals. Bill: Thanks for entertaining Vaughn...again. I should take some lessons. I tried and failed...maybe I'll just keep you in the diaper bag. My main kid-entertaining skill is almost dropping them on their heads.